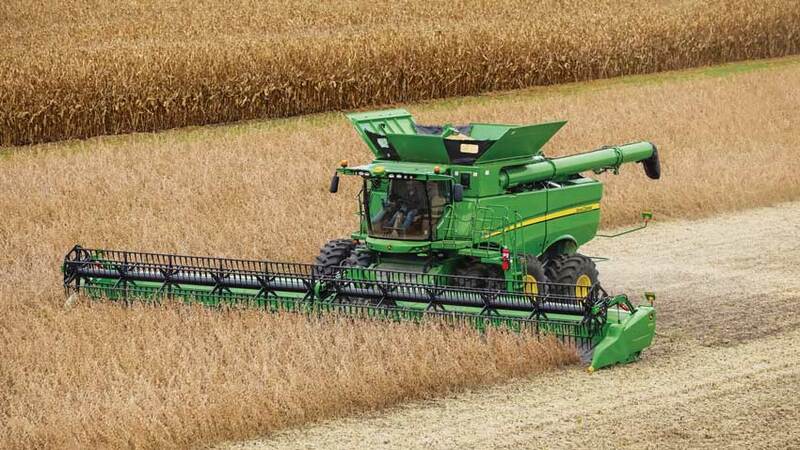 The John Deere S700 Series Combine was recognized by the American Society of Agricultural and Biological Engineers (ASABE) and Association of Equipment Manufacturers (AEM) as one of the best among the 50 products that received the AE50 Award earlier this year. This first-time JB Davidson award for engineering excellence was presented to John Deere at a special ceremony on February 27 during the 2018 Commodity Classic. The John Deere S700 Series Combine was recognized by the Society for its significant innovations in "smart" technology, improved operator comfort and data capabilities for more efficient grain harvesting, said Matt Badding, John Deere marketing manager for harvesting equipment. "We are honored that the Society and AEM selected the John Deere S700 Series Combine as one of three recipients for their inaugural engineering award and chose to present it in front of thousands of our customers at Commodity Classic," said Badding. "The new technologies engineered into every S700 Combine represents the level of innovation that the Society looks for and that provides real value to our customers." ASABE is an international scientific and educational organization dedicated to the advancement of engineering applicable to agricultural, food, and biological systems. From the many entries submitted each year, an expert panel of engineers selects approximately 50 products for recognition with the AE50 award. The award-winning products are those ranked highest in innovation, significant engineering advancement and impact on the market served.